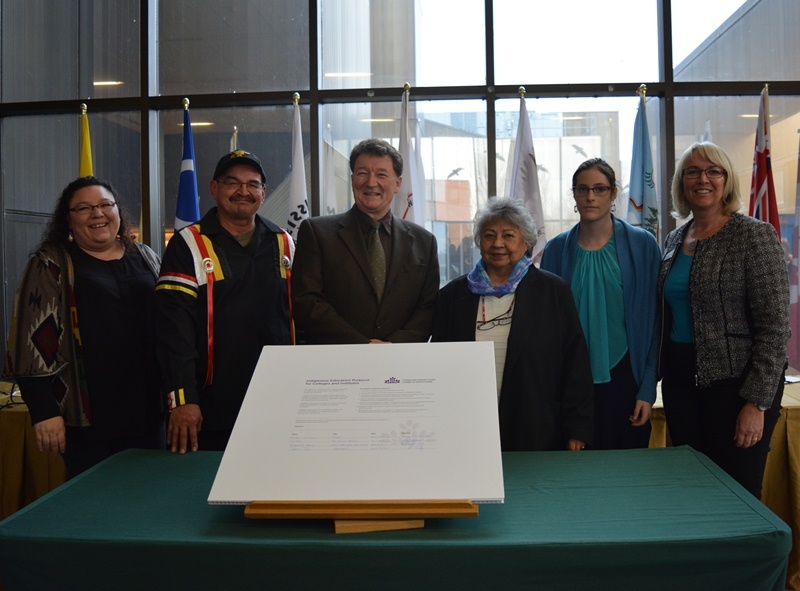 Fleming College today signed Colleges and Institutes Canada’s (CICan) historic Indigenous Education Protocol in a special ceremony at the Sutherland Campus. The Protocol is an aspirational document that reaffirms Fleming’s commitment to Indigenous education and provides a vision of how the college will strive to improve and better serve Indigenous peoples. Fleming College has a long history of supporting Aboriginal learners and has relied on its Aboriginal Education Council (an advisory committee made up of Aboriginal leaders) for more than two decades. At the same time, both Fleming’s Aboriginal curriculum and support services have continued to grow. The Protocol will provide event greater encouragement and incentive to promote and support Aboriginal education. 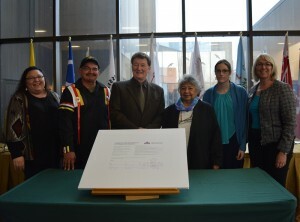 The Indigenous Education Protocol is being signed by colleges across Canada. It was developed by CICan’s Indigenous Education Committee, comprising college and institute representatives from across the provinces and territories, as well as through consultations held at the Serving Indigenous Learners and Communities Symposium in December 2013, and the CICan annual conferences in 2013 and 2014. Commit to making Indigenous education a priority. Ensure governance structures recognize and respect Indigenous peoples. Implement intellectual and cultural traditions of Indigenous peoples through curriculum and learning approaches relevant to learners and communities. Support students and employees to increase understanding and reciprocity among Indigenous and non-Indigenous peoples. Commit to increasing the number of Indigenous employees with ongoing appointments throughout the institution, including Indigenous senior administrators. Establish Indigenous-centred holistic services and learning environments for learner success. Build relationships and be accountable to Indigenous communities in support of self-determination through education, training and applied research. Located in the heart of Central Ontario, Fleming College has campus locations in Peterborough, Lindsay, Cobourg and Haliburton. Named for famous Canadian inventor and engineer Sir Sandford Fleming, the college features more than 100 full-time programs in Arts and Heritage, Business, Environmental and Natural Resource Sciences, General Arts and Science, Health and Wellness, Justice and Community Development, Skilled Trades and Technology, and Continuing Education. Fleming College has more than 5,800 full-time and 10,000 part-time students, and 68,000 alumni.